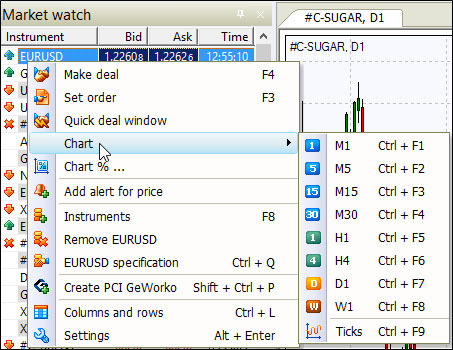 To open a new chart, right-click on a trading instrument in the "Market watch" window, select "Chart" option and the timeframe from the context submenu. 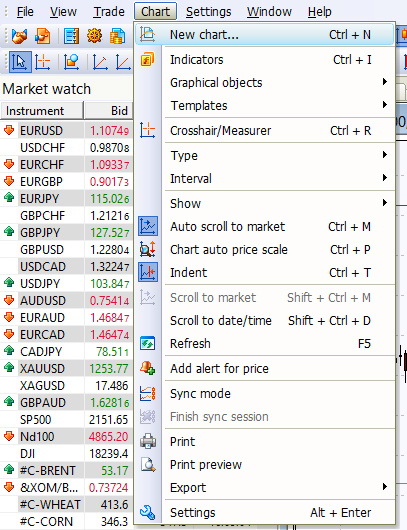 You can open a chart by the same option if you right-click on the instrument you prefer in the "open positions", "Orders" and "Sum open positions" windows. Additionally, you may open a new chart by choosing the "Chart" from the main menu. By choosing "New chart..." option a pop-up window will appear where you can choose any instruments you want and set chart parameters. 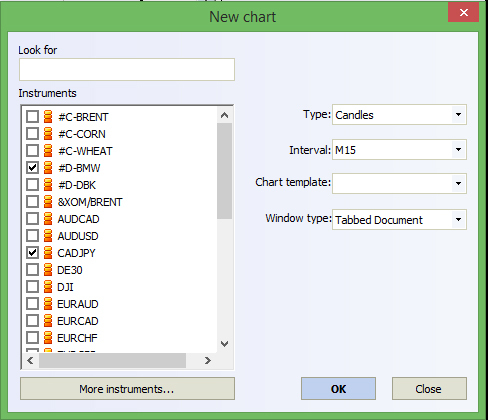 In this window, you can select one or several instruments from the list of “In use” instruments, and one or several charts will be opened for each instrument, as well as set parameters for forming charts – Type, Interval, and Template. In addition, you can select instruments form the list of “All Instruments”, which will be added to the list of “In use” instruments simultaneously with the formation of charts. If several charts were previously opened in the terminal, then, when opening the terminal or adding a new workspace, all charts, except the active ones (opened on the workspace), are not formed. Only after the first activation (display) of the chart, it is formed and later remains formed. You can also activate the chart by selecting the function "Windows…” (with the list of charts) in the submenu “Window” of the terminal's main menu.